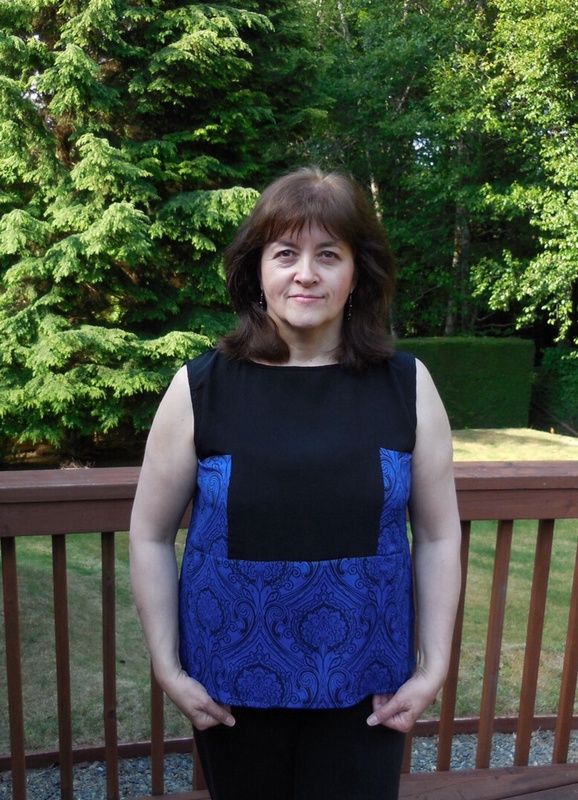 Indie Pattern Month and a “New-to-Me” – Nice dress! Thanks, I made it!! 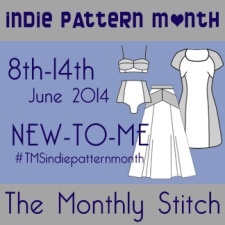 Some of us already know it is Indie Pattern Month at the Monthly Stitch, and for those who don’t… Well… It is! 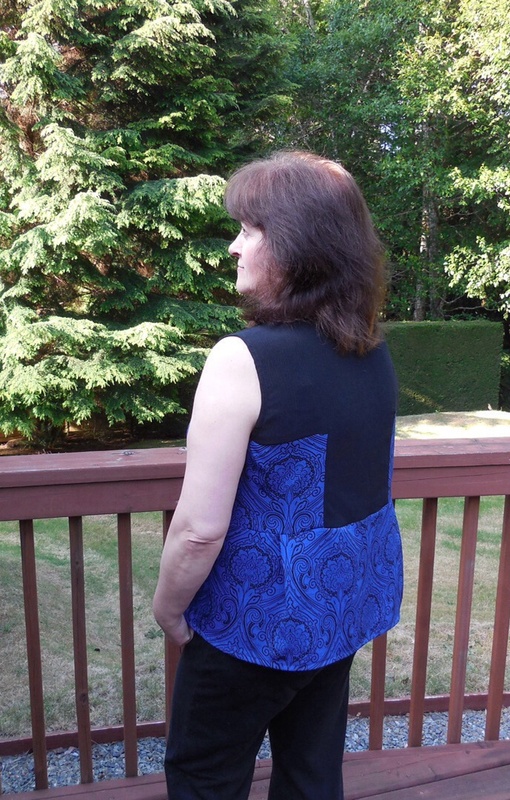 This week’s challenge is “New-to-Me” – you have to sew up something using a pattern from an independent pattern maker, but it has to be a maker you have never tried before. I have had the “Teach Me Fashion” two tone singlet PDF pattern on my mind for a while now – the possibilities with the colour blocking are endless! You can find the pattern here. 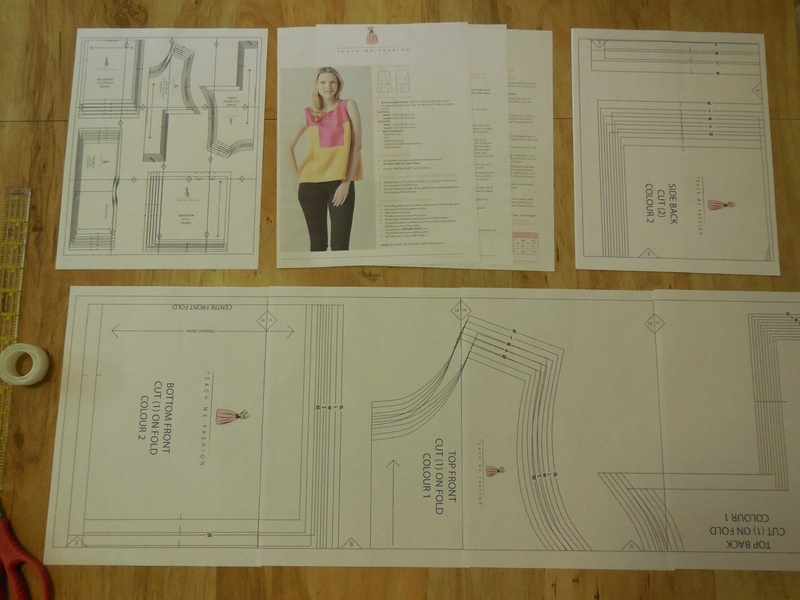 This PDF pattern has a whopping twelve pages (pfttt) and was the easiest I have ever seen to print off and assemble and cut out. 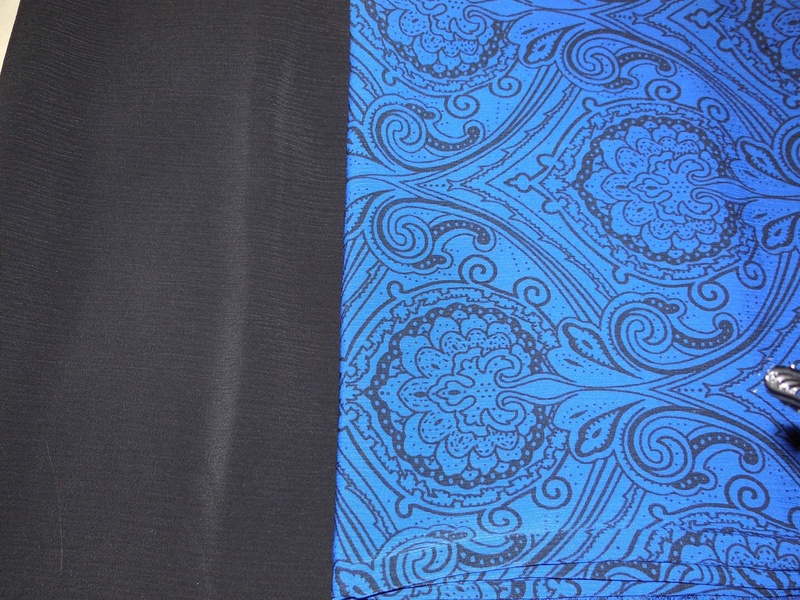 I purchased this beautiful blue and black print and a plain black for the two different colour blocks. First thing I noticed was the pattern pieces didn’t look like a “normal” top pattern, I could see the neckline and armholes, but the rest of the pieces just looked like strips. Luckily, Teach Me Fashion patterns come with a You Tube video demonstrating it all! So after watching the video all was clear – layout, assembly, the works! The most difficult step when sewing up this top was the four 90 degree turns on the colour blocks – NOT! Teach Me Fashion’s You Tube video demonstrated how to sew those reinforced 90 degree corners easily! When I wore the finished top to work, someone actually thought that the black and the blue/black print were one piece of fabric not two joined pieces. It was a success! So now we have the finished garment on my model, who doesn’t have beautiful blond hair, but she does have a lovely grimace on her face because she doesn’t like having her photo taken! Not only that, the sun is peaking over the roof and shining on her head giving her this weird aura – thanks to the photographer for not noticing that before he took the shot! Easy instructions – they are brief in the printed version, but the You Tube video shows it all! It is a very easy sew! 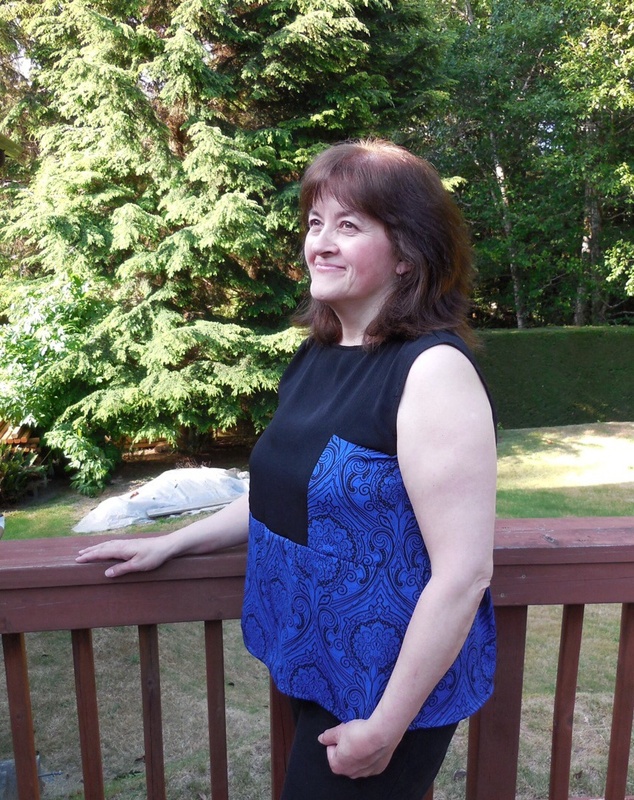 Like or dislike about the pattern – This colour block top is definitely two dimensional, some darts would be nice, but then I guess that would take away from my blue print and my colour blocking! Cost of materials – $6.00 for the blue print, $1.54 thread, $10.00 for the black fabric, free pattern = $17.54 plus tax, of course! I want to try this pattern again in a silkier fabric, just to see how it hangs! Thank you Teach Me Fashion for your lovely pattern! This top looks great, the pattern seems ideal for colour blocking, makes me wanna try it out… And, I’m guessing it must have been delightful to receive such comments from your colleagues! Yes, I have been very happy with it! You should try it too! Isn’t it neat trying something new? Again, your colors are lovely and the blouse looks lovely too. I’m trying something new, too, but I don’t want to show anyone … yet, in case it doesn’t work. Way to go. Thank you! Can’t wait to see your’s! Looks great. And I love your hair! We absolutely love your blog and you did a great job of the Two-Tone Singlet! We would love to get in touch but can’t find your email anywhere, if you could send me an email at harrison@teachmefashion.com we would like to send you some more patterns. Thank you for the compliment! I will email to you my email. I warn you though … ha, ha, ha … my family comes first, then my full time day job, then my hobbies – jogging and sewing! (Too much to do and not enough time!) I do love your singlet pattern though. I tell everyone who asks that I do! But I am also very fussy (perhaps my family and friends would say “opinionated”?) Those opinions are usually either “I love it!” or “Man, that’s stupid!”. Anyway… love to hear from ya! And thanks for reading!